The line of length 1291 m includes 3 passenger stations. Outrun intervals are 816 and 475 m. The train passes them for 3 and 2 min with speed up to 30 km per h.
The starting station "Entrance gate" is maintained as entraining-disembarking one, the middle station "hall Abkhazia" - as disembarking one, and the final station "hall Anakopea" - as entraining one. The line is one-tracked, narrow-gauged. Width of a gauge is 914 mm. The depot is situated just before the starting station at side, opposite to the tunnel to the cave. The double-tracked branchs are available in tunnel after starting station and in a hall of final station. Also between starting and middle stations there are 2 asides towards to service tunnel and station. 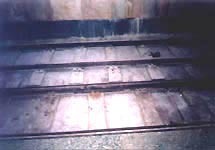 A small part of rail track before the depot comes out under coat. Full length of all tunnels is about 2 km. The 6-carloaded single train plies by the line. Besides, there are 2 reserve passenger cars in the depot. The power supplies of the rolling-stock are obtained from the contact rail, located between running rails and shielded by a cover. At stations the contact rail is not present, so the rolling-stock passes them by batteries. The direct current with a voltage of 300 V is used. 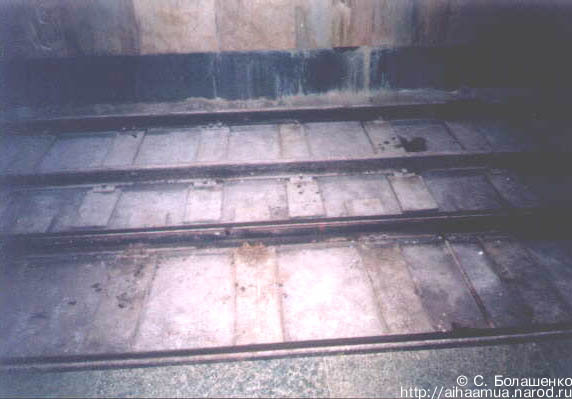 The diameter of the horseshoe-like tunnel is about 2.5 m. The rails are stacked on wooden cross ties. 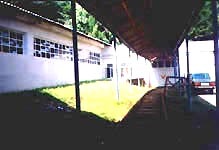 On the one side of a track the side-path of 0.5 m width is available for pass of the serving workers. In a tunnel there is an duty illumination. The traffic lights are not present. The mine' telephones are used as a communication facility. The rail switches are manual elsewhere. The regular passenger traffic is 0.7 mln in a season, i.e. up to 2 thousand per day. 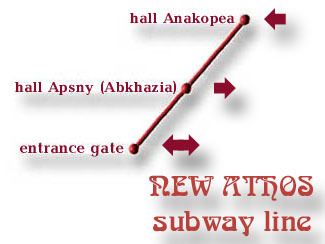 The construction of subway was carried out in 1965-1975 by tunnel group No 9 and building-mounting train-group No 212 of company "Tbiltonnelstroy" under guidance of G.Djakeli. The boring-exploding method was used. booklets "New Athos cave" of 1978 and 1989.